I attended Georgia Military College and received an Associate of Education Degree. I then attended Valdosta State University and received a Bachelor of Science in Middle Grades Education. I am certified in the areas of language arts, reading, and social studies. This is my twelfth year teaching at Cook Middle School. I will be teaching eighth grade ELA. I look forward to the 2018 - 2019 school year. 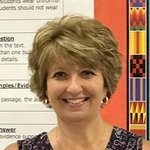 Hi, I am Mrs. Serrano, and I have lived in South Georgia for the past seventeen years. I am originally from Robbinsville, North Carolina. Over the past 33 years, I have traveled many places within the United States and abroad with my husband Mike. We spent 12 years in the desert of Northern Nevada. While living there, we had our two children Cierra and Tanner. I thoroughly enjoyed living out west. However, moving back closer to my family has been great.